The term avatar refers to a soul who has been freed from maya (delusion) and is sent by the will of God back into manifested existence to help others, like the founders of major world religions like Jesus Christ, Buddha, and Krishna. Actually an avtar is born not to show us how great he was, but to give us hope that the state of consciousness he had attained, we too can attain. An avatar (from the Sanskrit avatāra: meaning “downcoming”) refers to a “descent” of the divine into the realm of material existence, usually for the purpose of protecting or restoring dharma (cosmic order, righteousness). .
An Avatar is also called a Messenger of Divine Mother because an Avatar transmits pure unselfish Divine Love from the Divine Mother to man and gives a taste of the unadulterated nectar of heavenly bliss to the arid souls scorched by the fire of worldliness. Avataris a fully freed soul incarnating directly from God on this physical planet or elsewhere. An Avatar fulfills a highly spiritual task in the name of God and returns to God after accomplishing his task. His Love for God and his creation is beyond description and imagination, his faith in God absolute as there is no difference between an Avatar and God. Traditional Hindus believe an avatar to be a direct manifestation of God, rather than a re-incarnation or re-appearance on earth of a soul that has been liberated. This is somewhat analogous to the understanding that many Christians have of Jesus Christ, who they consider as having never been in human form before he was Jesus Christ. Avatar, is not that Divine Consciousness, which has never known imperfection, appears in human form to show us a reality completely alien to our own. Krishna, Jesus Christ, and all other avatars are not only manifestations of Spirit. They are descents also in the sense of knowing, from experience, what it is to be human beings who attained oneness with the Divine. Their example shows us our own divine potential.Krishna, who some Hindus consider to be a full incarnation (purna avatar) of Vishnu, stated to Arjuna in the Bhagavad Gita that “You and I, Arjuna, have passed through many births. I know them all, even if you do not.” (Thus Krishna himself declared that he had incarnated previously. The standard list of the Dasavatars bears striking resemblances to the modern scientific theory of Evolution. Matsya, the fish, represents life in water, and Kurma, the tortoise, represents the next stage, amphibianism (although technically, a tortoise is a reptile, not anamphibian). The third animal, the boar Varaha, marks the development of life upon land. Narasimha, the Man-Lion, represents the further development of mammals. Vamana, the dwarf, symbolizes the incomplete development of human beings, while Parashurama, the forest-dwelling hermit armed with an ax, connotes completion of the basic development of humankind, perhaps in the form of barbarism. Rama indicates humanity’s ability to effectively govern nations, while Krishna, allegedly an expert in the sixty-four fields of science and art, indicates advancement in culture and civilization. Buddha represents the further intellectual advancement of man, culminating in the realization of even greater spiritual truths. Thus, the avatars represent the evolution of life and society with each epoch from Krita Yuga to Kali Yuga. This progression of animal life from the sea creature to the intellectually enlightened human is not incongruent with modern evolutionary theory. This connection gets particularly interesting when taking into considerations descriptions of Kalkin, who has sometimes been described as being a yantra-manava, or a “machine-man,” which could be interpreted to suggest the future development some sort of technologically enhanced human being which is as of yet unknown. For Hindus, the concept of avatar is associated mostly with Vishnu, who represents the aspect of God as preserver in the Hindu trimurti. The other two aspects of trimurti are Brahma as the creator and Shiva as the destroyer, or dissolver of creation. There are also avatars of other Hindu deities in the Puranas, including avatars of Shiva, Devi (or Divine Mother), and Ganesha. 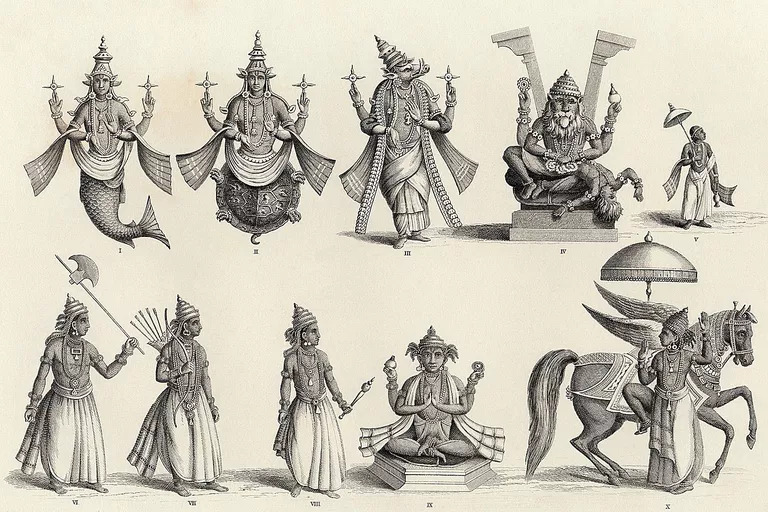 The Linga Purana describes twenty-eight avatars of Shiva. The Devi Bhagavata Purana tells of the avatars of Devi, and the Ganesha Purana describes the avatars of Ganesha. Purna Avatar means full Avatar, in whom all sixteen rays are present. Lord Krishna was a Purna Avatar. There are also Amsa Avatars with partial incarnations. Sri Sankaracharya was an Amsa Avatar. Lord Rama was a Lila Avatar with fourteen rays. Ancient Rishis, modern philosophers, and theosophists mention seven rays, twelve rays and so on when they describe the stage of spiritual development of their Gurus, Spiritual Masters and Adepts.There is a decline of righteousness from the Satya Yuga, or Golden Age, to Treta Age, Dvapara Age and Kali Age respectively. In the Satya Age, Dharma, or righteousness, flourishes. In Treta Age the decline begins and becomes rapid in Dvapara Age. In Kali Age, the most evil of the ages, unrighteousness or Adharma prevails. In this age the God, manifests Herself for the establishment of righteousness. The Hindu Vishnuites classify the incarnations of God variously as direct and indirect, or major and minor or primary and secondary incarnations. In the former God descends into our plane either fully or partially, described as purnavataras and amsavataras respectively For the purpose of clarity and understanding, his main incarnations are called Vibhavas and his minor incarnations vibhavantaras. The major incarnations are ten in number and known as the ten incarnations (dasavataras) of Vishnu. In this incarnation In Hindu mythology, Matsya saved Manu Vaisvasta, the eventual creator of the human species, by rescuing him from tempestuous waters during a great flood which ravaged the primordial earth by carrying his boat to the top of a mountain. In this incarnation, Vishnu assumed the form of a tortoise, the kurma. Kurma offered his broad shell so the mighty churning stick could be firmly set upon it. and held the Mandhara mountain from beneath as the gods and demons used it to churn the oceans for the sake of amrit, the elixir of life. In this incarnation He assumed the form of a boar and slew a demon named Hiranyaksha Varaha battled and defeated the demon Hiranyaksa beneath the cosmic ocean, then proceeded to rescue the earth goddess Prthivi from a watery grave by placing her on his tusk and swimming to the surface. when he carried away the goddess earth to the nether worlds. In this incarnation He helped his young devotee Prahlada when he was tortured by his demon father, Hiranyakasipu for his intense devotion. 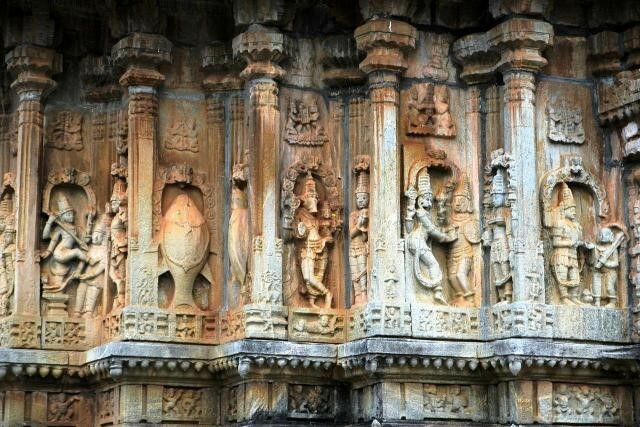 Listening to the calls of his young devotee, He sprang out of the pillar of a building as Man¬Lion (Nara-Simha) and slew the demon.Narasimha used his status as neither fully human nor fully beast to defeat Hiranyaksipu, another oppressive demon who was invulnerable to both human beings and animals. In this incarnation Vishnu took birth as a dwarf to sl ay the demon Bali and restore the heavenly kingdom of Indra back to him. Vamana asked Bali for all the territory he could encompass in three strides. Bali gladly agreed,. Vamana assume his cosmic form as Vishnuand traverse the entire universe with his three steps. With one step he covered the whole earth. With another he covered the whole empyrean and with his third he pushed Bali’s head deep into the world. In this incarnation He assumed the birth of a priestly warrior to exterminate the Kshatriyas who grew wicked and tyrannical and neglected their duties in upholding the dharma and protecting the people.. In a number of battles, Parashurama defeated the Kshatriyas, and restored the priority of the priestly caste, the Brahmins, who had been oppressed by their traditional underlings, the warriors. In this incarnation He took birth as the prince of Ayodhya to kill the demon Ravana who became invincible by virtue of the boons he got from Lord Siva and became a menace to the three worlds and their inhabitants. Rama, defeated Ravana and thereby freed the world from the demon’s clutches, instituting a reign of virtue and prosperity. This kingdom would serve as an ideal societal structure for rulers in every generation that followed. The eighth incarnation, Krishna (meaning “dark colored” or “all attractive”), is the only avatar to have appeared in the Dwapara Yuga. During his appearance on earth, Krishna defeated the oppressive demon Kamsa while aiding the Pandava brothers to victory over their malevolent cousins, the Kauravas. This battle is recorded in the great Hindu epic, the Mahabharata, which is best known for a poem included within it, the Bhagavadgita, wherein Krishna elucidates the path of righteousness for Arjuna, a Pandava warrior. The identity of the ninth avatar is disputed. Normally, the Buddha is listed as the ninth avatar but sometimes Krishna’s brother Balaramais listed instead. For instance, the Bhagavata Purana claims that Balarama was the ninth incarnation. However, traditionally it is the Buddha who fulfills this role as the ninth avatar, albeit it should also be noted that Buddhists do not accept this doctrine and deny that the Buddha was an avatar of Vishnu. Some scholars suggest that the absorption of the Buddha into the Vaisnavite theological framework was a polemic effort to mitigate the appeal of Buddhism among the Hindu masses. The tenth avatar, Kalkin (“Eternity” or “The Destroyer of foulness”) has set to arrive at the end of the Kali Yuga,. Due to his pending arrival, Kalki is the most mysterious of the avatars, though he is described as a rider upon a white horse wielding a comet-like sword. It is said that Kalki will bring the world to its end, rewarding the virtuous, while punishing the wicked. the Minor Incarnations are partial or minor incarnations of God in which He imparted His knowledge, powers or qualities to several advanced Jivas, either directly or indirectly, for the benefit of the mankind. The list of minor incarnations of Vishnu is exhaustive. The following contains some of his most important vyuhantaras. In current times, the famous south Indian guru, Sathya Sai Baba (c. 1926-present), is believed by his devotees to be an avatar of Shiva,Shakti, and Krishna. Some Hindus with an inclusivist outlook perceive the central figures of various non-Hindu religions to be avatars. Some of these religious figures include: Jesus (4 B.C.E.-c. 33 C.E. ), the founder of Christianity, Zoroaster (a.k.a. Zarathustra), the founding prophet of Zoroastrianism, Mahavira (599-527 B.C.E. ), promulgator of the tenets of Jainism, , as well as Bahá’u’lláh (1817–1892 C.E.) the founder-prophet of the Bahá’í Faith, who is believed to be Avatar.